At the Beijing International Airport with my DPRK visa. Boarding Air Koryo, the national airline of DPRK and supposedly "the world's worst airline". 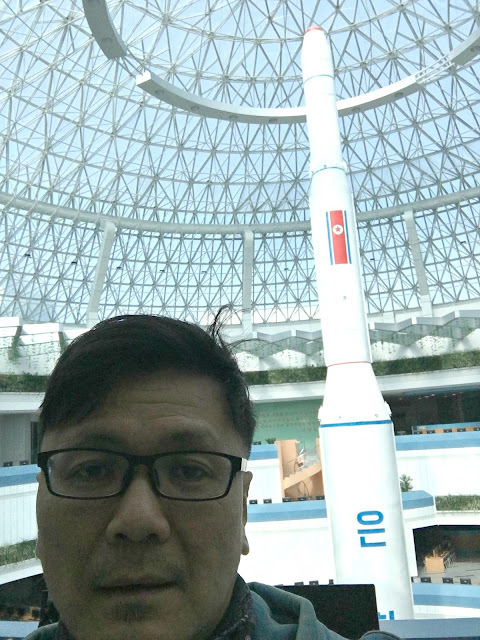 In the arrival hall at Pyongyang Sunan International Airport. The Grand People's Study House. The 22m-high bronze statues of Kim Il Sung and Kim Jong Il. A bridal shoot in front of the monuments. In my hotel room where the toilet bowl has been disinfected for my protection. Lunch in the hotel banquet hall. After lunch, I had a haircut in the hotel barber shop. In a DPRK metro train station after a long escalator ride down. Taking the train with my new haircut. Heading towards the May Day Stadium, the world's largest stadium with a capacity of 150,000, where the marathon will start and end the next day. Inside the empty stadium. The temperature was in the teens. View from the tower balcony. Outside the stadium on marathon day. Starting my 10km run inside the stadium. Running past the Arc of Triumph. At the 10km finish line. Back to the hotel for a late lunch before more sight-seeing. Sampling the water from a well near Kim Il Sung's birthplace. A Chelsea foosball table outside the cafe! Back in the hotel lobby in front of a fish tank. Inside the science and technology complex. This was actually the most fun place to visit, especially the children's area. On the bus leaving the complex. At the Monument to Party Founding with my sister. Lunch in a hotpot restaurant. Outside the airport cafe waiting to depart. My last meal on the "world's worst airline".